GRID wrote: What happens to MAX on Main after the streetcar? Move to Broadway or something? Likely scenario is that the existing service between UMKC and River Market gets reallocated to other corridors (probably not on Broadway). South of UMKC will likely become a "streetcar connector" that terminates at the Plaza. Still very preliminary. Every MAX upgrade requires more operational funding, which has essentially been fixed or in decline (fares, city match, etc.). Prospect MAX will require more operational funding for the higher level of service, and Independence MAX will need the same when it goes live. A relatively easy cut in these new MAX corridors is the existing local service (25 Troost, 71 Prospect), but those have more vocal constituencies than the 56 that used to run in parallel to Main MAX (which isn't a bad thing). 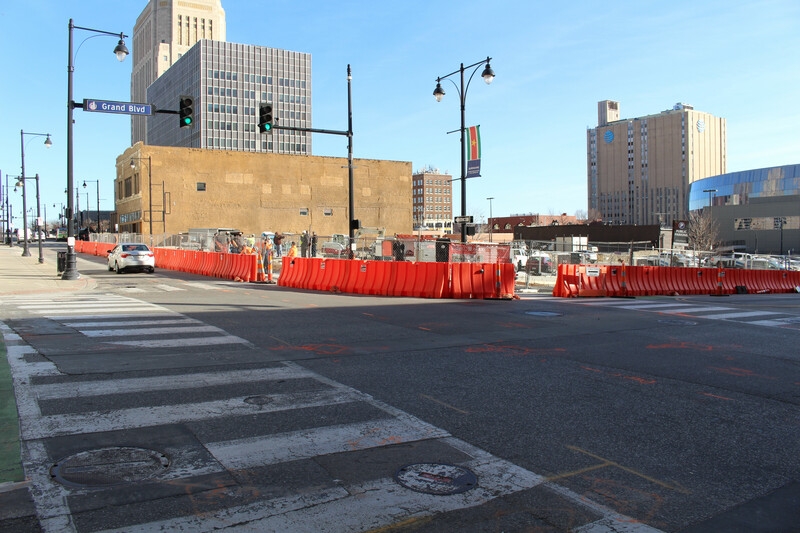 Construction has started at 12th & Grand and Petticoat & Main, so you'll see the new MAX look before the end of the year. Both locations will have level boarding for MAX routes. 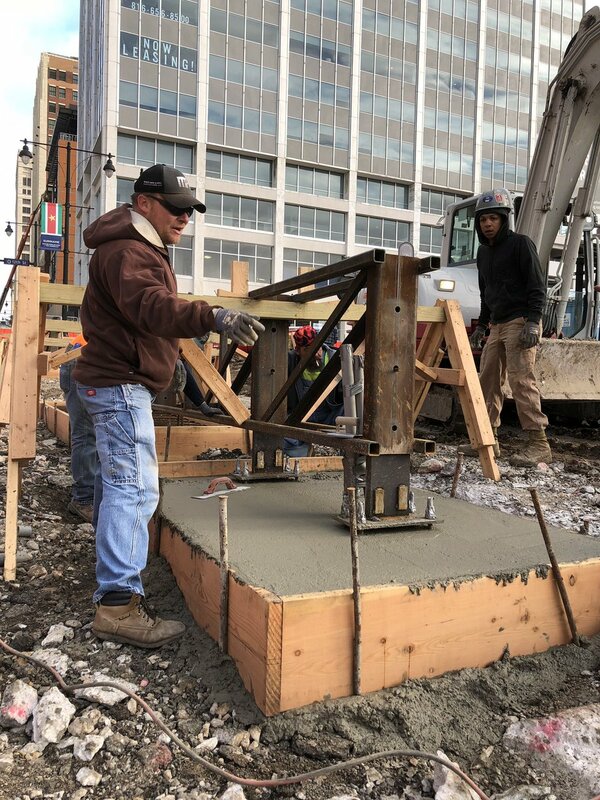 First concrete pour for Prospect MAX happened this week. This section will be done by the end of the year. This section will be done by the end of the year. 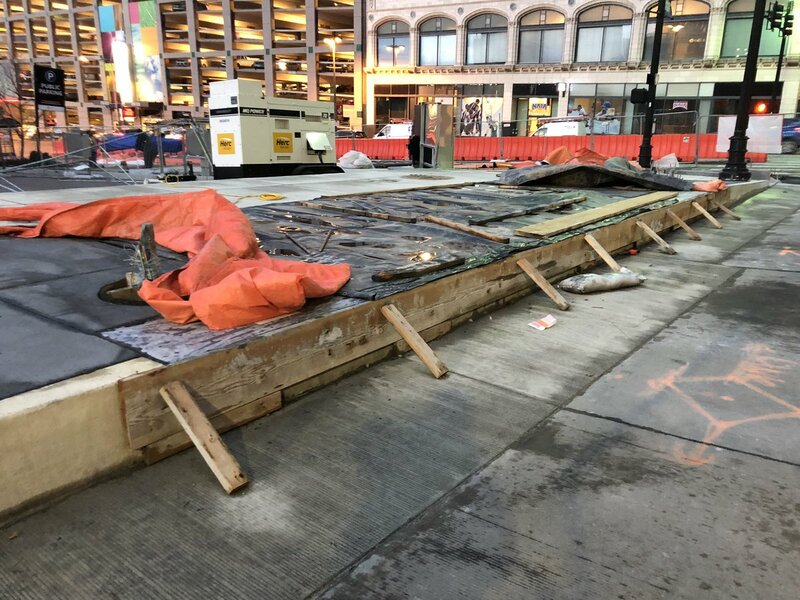 That's a lot of construction for a bus stop. Something substantial needs to go on that block and soon. It's a very special bus stop! #1 bus boarding location in the entire region. The snow melt system has taken a lot longer to install than previously thought, but given our winter thus far I think we can say it's a good investment. First level boarding platform is complete! Shelter/kiosk install, vehicle testing, and operator training will take place here soon. How far off is petticoat? We've had a few issues there, beyond the concrete pours (electrical, complications with the underground garage). At least the end of February. Underground garage you say? Is that the Commerce garage? I didn't realize it went underground. The entrance to the One Petticoat Lane garage is off Walnut. It doesn't connect to the Commerce garage off Main as I recall. Ahh yes, forgot about that one. The One Petticoat garage wall is right under Petticoat's curb. New MAX buses -- a preview of the fleet that's coming for Prospect MAX -- are in service now on Main and Troost. Features include new seat vinyl seats, fixed windows, USB charging, new interior lighting, onboard video screens with real-time route location, new paint scheme, and more leg room. All of the vehicles are powered by CNG, with two new electric buses arriving later this year. I'm mixed on the fixed windows. I know they make for annoying rattling but sometimes I've needed a fresh breeze. Yeah, sometimes drivers run the heat high when 50s to 60s and I need to open window just to breathe. I don't like to think about a fixed-window bus plunging into a lake with freezing water and no way to lower the windows to escape.